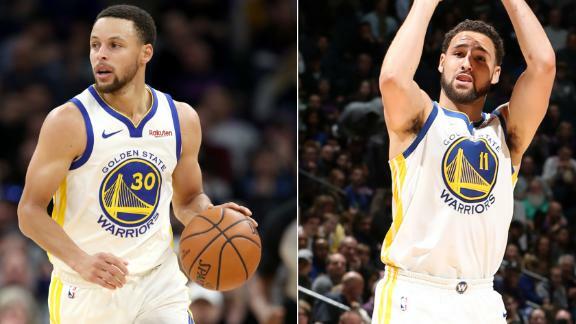 MINNEAPOLIS -- Golden State's most recent homestand included a 33-point loss to Boston and a startling defeat to last-place Phoenix, reminding the Warriors of the work that's ahead of them to win a fourth NBA championship in five years. The beauty of the Warriors -- or irritation, depending on the rooting interest -- is how quickly they can recover. They used a 21-3 run over the next 5:51 to take control, with their long-range shooting simply too much for this undermanned Wolves team that, even at full strength, is vulnerable defensively. Klay Thompson and Steph Curry combine for 64 points as the Warriors head into Minnesota and take down the Timberwolves 117-107.